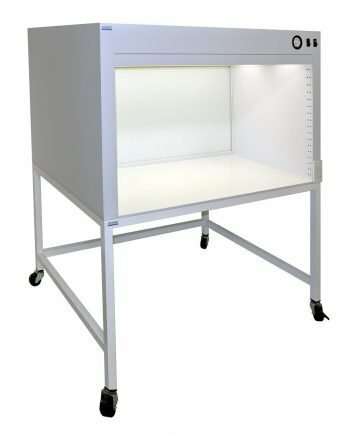 Horizontal laminar flow hoods simply create a sterile workspace by pushing the stream of laminar sterile air through the workspace from HEPA (Or ULPA) filters positioned behind the work zone. 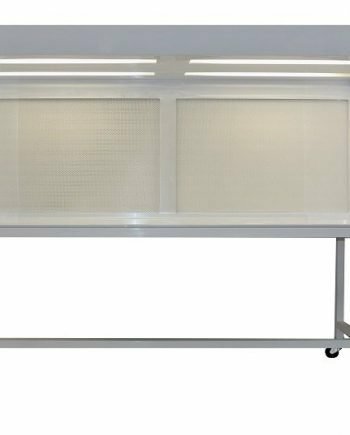 Cleantech horizontal clean benches can be utilized for the pharmaceutical, medical, food manufacturing and application like tissue culture, mushroom cultivation, electronics assembly and any other process required ISO level 4 or 5 of cleanliness. 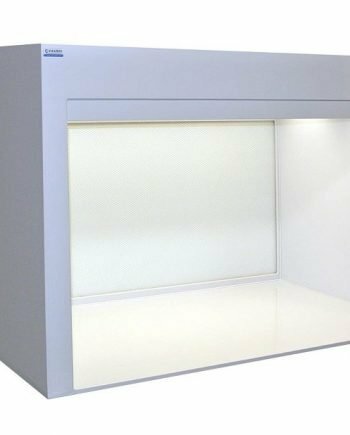 These polypropylene horizontal flow hoods feature front-side perforated edges to minimize turbulence in either sides of the work area, built-in recessed lights to provide diffused lighting without interfering with laminar air flow and low energy/ low noise fan system. They are available in 3 to 8 feet length. Customization is available upon request. Options include epoxy coated steel supporting stand with caster, Stainless steel interior worksurface, UV sterilization light, built-in power outlet are available. Front hinged sash or door can be installed in some sizes. • Construction: Polypropylene Hood construction & epoxy powder coated steel stand. • Air Re-circulation: Air slots along the side edges to minimize backwash and turbulence in the work area. • Pre-Filter: Washable polyurethane foam. • Final Filter: HEPA: 99.99% efficient @ 0.3µm particles. • Fan Motor: Direct drive, forward curve, centrifugal-type with sealed bearings; rated for continuous duty; furnished with overload protection and a two-speed switch. • Average airflow velocity: 90 feet/minutes (fpm). • Air Flow: 650 4-Feet Model; 480 3-Feet Model. • Sound Level: 50 dBA, measured no more than 30” from filter face @ 90 FPM. • Electrical: 110VAC, 50/60Hz Meets the requirements of the National Electrical Code and applicable local codes. All components UL listed and CE marked. • Performance: Particle count exceeds Class 100 requirements.